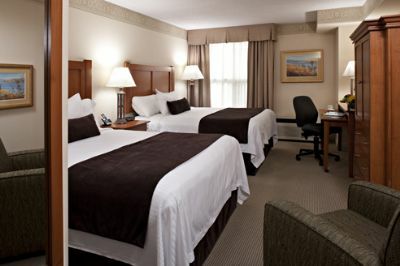 Centrally located near the Okanagan Lake, Grand Okanagan Resort offers beautiful views and pet-friendly rooms. The natural setting of the grounds and 25 acres along the shores of the lake provides opportunities for a variety of water sports. When visiting British Columbia, this resort is perfect for business trips, social events, or getaways with family and friends. These Kelowna timeshares for sale come in studio, one, two and three bedroom unit configurations at Grand Okanagan Resort. These units will sleep from two to ten people and you don’t have to leave your pets at home. Pet-friendly rooms are available and you need to mention your furry friends when making your reservations. Larger units feature a full kitchen with dishwasher, washer and dryer, and a balcony overlooking the lake. All timeshares offer free Wi-Fi and televisions in the main living area. Some units also offer up to two bathrooms for your convenience. Whether you are traveling with family or friends, these modern, spacious units will make you feel relaxed in your very own vacation home. On-site amenities include both an indoor swimming pool and a heated outdoor pool. The fitness center is perfect for a workout with free weights and treadmills. Before heading out for the day, you should enjoy a leisurely breakfast at OAK+CRU Social Kitchen and Wine Bar. Spending time on the lake water skiing, kayaking, boating or taking advantage of the beautiful weather with a bike ride around town are perfect for guests of all ages. After returning to the hotel, you may want to enjoy some time at the spa or the casino. Spending time at one of the many gorgeous golf courses, walking through the quaint towns shopping and sampling local cuisine at the local restaurants, or just relaxing by the lake make this British Columbia resort perfect both families and groups meeting for business. 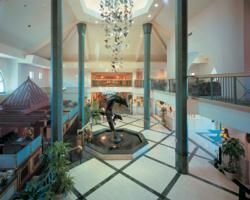 Kelowna timeshares for sale can offer a variety of units at Grand Okanagan Resort to make visiting the area comfortable and stress-free. Visiting the local wineries, golfing with friends, or spending quality time with loved ones makes this destination perfect for creating memories. Contact Grand Okanagan Resort and Conference Center Specialist Today!